The other night we were enjoying Margarita Wednesday with some friends at a place called Los Mariachis and for some reason, my hubs proclaimed that I was the red beans to his rice. In all seriousness I looked at him and asked if this meant I made him gassy. Other than the kind of cute cobalt dish, this does not appear to be a particularly flattering proclamation. 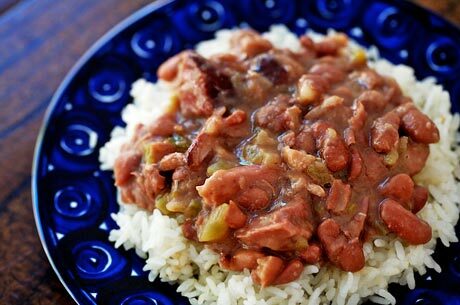 Because of my food touching/texture/refusal to eat certain items I have never actually had red beans and rice but my born and raised outside of New Orleans husband LOVES them. So whereas I decided he was calling me squishy and gas-inducing-he was actually saying I add the spice and flavor to his life. Well, when you look at it that way it’s sweet. So yes, I am the red beans to his rice. In a good, non-gassy way. Hi Amy-I found you through Joann’s blog. Speaking of Joann, I seem to recall her saying once that she has a fantastic red beans and rice recipe and something about the secret ingredient being vinegar. Just in case you ever wanted to try them. Looking forward to following you. That is sweet (and gassy) but mostly sweet! Hahaha!! Isn’t that sweet? I love how things don’t always come out just right (pun intended, kind of?). Very cute! Sometimes the hubs do say the sweetest things in the funniest ways. Love your humor! And, as other have said – you guys sound so sweet together (awww. ).